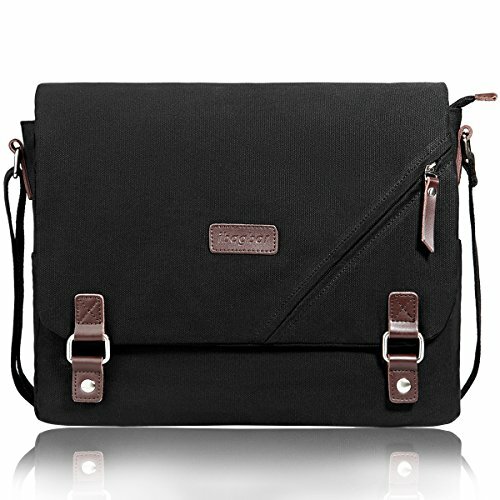 ibagbar Upgraded Canvas Messenger Bags 14 Inch Shoulder Crossbody Bag Laptop Computer Bags with Padded Sleeves Vintage Satchel College School Bag Bookbag Working Bag for Men and Women (Black 001) | What Should I Say? Durability, Spacious, Vintage, This Reliable Messenger Bag is Perfect for Your Everyday Use - premium quality fabric make it durable too! ✔Made of heavy duty canvas fabric, non-fraying stitching, and strong zippers. Reinforced seams in shoulder straps, without ripping.Well made,classic design, that means you'll have a shoulder crossbody bag that lasts for years. ✔ Freely adjustable shoulder strap buckle, you can adjust it according to your height and comfort requirements. ✔ Large capacity and multiple pockets makes your stuffs lay in the bag systematically. *Padded Laptop sleeves* of main compartment will protect well for your laptops. ✔ It's a comfortable and adjustable shoulder bag for school, working, traveling and eveyday using.Ideal for men, women, teens,high school students,college etc. What you can put in this stylish sling bag? - You can put 14" laptops, 13" MacBook Pro, A4 books, ipad, glasses, wallet, keys, cell phone, umbrella, document and cigarette in the bag. How to maintain the classic messenger bag? We also offer One-year Warranty! Go ahead and Order One for yourself right away, and make your essentials organized! 【Large Padded Compartment】Upgraded! 15" L x 12" H x 5"W. Roomy enough for all of your stuffs. A total of 9 pockets. This vintage messenger bags features a thick foam padding laptop compartment with velcro closure protecting your electricity device (up to 14 inch) from accidental bump, shock, scratch. The back pockets fits your valuables. 【Durable & Top Quality】Made of heavy duty and black canvas fabric, smooth zipper, stronger quick magnetic. We have used better leather and better reinforced sewing method on our school bag. 【Comfortable to Wear】The shoulder straps of work bag can be fully adjustable, nice and wide so it feels comfortable on your shoulder. Get a classic laptop bag that you will receive many compliments from your family and friends. 【Secure Design】 Stronger metal magnetic buckles, secure for your valuables. It's unisex satchel bags for men and women, perfect for college, back to school, business and hiking and so on. 【Satisfaction Guarantee】 All of our shoulder bags have 1-YEAR WARRANTY. Just order this canvas crossbody bag if you love it, there is no worry about the issue. If you have any question about this bag, please feel free to contact us, we will try our best to make it right.